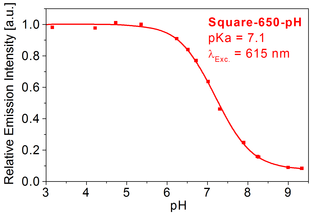 pH-measurement in cells: Probes such as Square-650-pH-Carboxy and labels such as Square-650-pH-NHS exhibit pKa's in the physiologically relevant pH range and are therefore useful to measure the intercellular pH changes in cells. 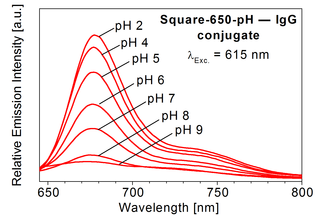 For more information about these dyes we refer you to the specs sheet of Square-650-pH-Carboxy and Square-650-pH-NHS and the published literature. 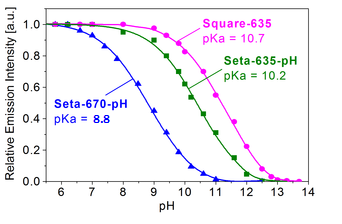 pH-probes with alkaline pKa's: The pH-sensitive dyes with pKa's in the alkaline pH range (see table below) are available in probe and reactive formats. Their pKa's range from 8.8 to 10.7.